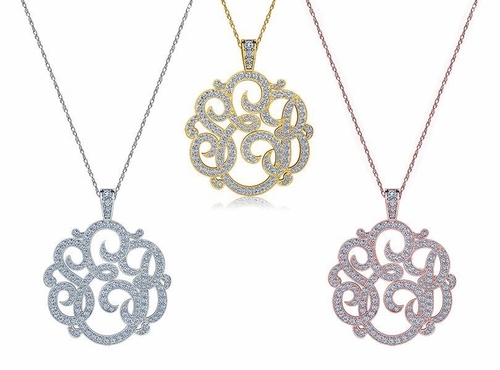 The Personalized Three Letter Script Monogram Cubic Zirconia Pendant Pave Diamond Look Necklace - Small 1 Inch features laced intertwined letters inspired by era of Louis XV, known as Louis the Beloved, King of France from 1715 until his death. Each letter in this custom made piece typically represents the first initial in someone's first, middle and last name. This romantic period piece beautifully displays by the ornamental English letters also known as the "intertwined monogram". 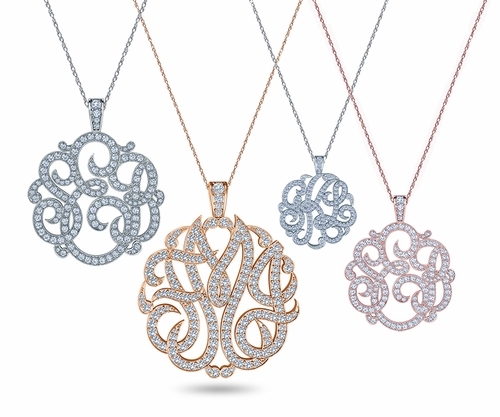 Three letter Monogram Interlaced script pendants like this were highly popular and typically commissioned by aristocrats and wealthy individuals to high end jewelers like Harry Winston or Asprey Jewelers of England. Many celebrities, heads of state and royalty desire this highly personalized monogram pendant because of its historical origin and familial significance. This stunning pendant measures approximately 1 inch or 25mm in diameter, and is hand pave set with the finest hand cut and hand polished diamond quality cubic zirconia. Stone color options include canary yellow, simulated pink diamond, man made lab created red ruby, man made blue sapphires and man made emerald green gemstones. Choose from your choice of 14k white gold, 14k yellow gold, 14k rose gold, 18k white gold, 18k yellow gold or precious platinum. The pendant is shown with a fixed pave encrusted bail that adds to its ornamental look and also can be custom made with a fixed chain that is attached on each side of the pendant, making it a fixed necklace. Comes standard with a 16 inch fine rope chain. An 18 inch and 20 inch chain length upgrade are also offered. For further assistance or additional customization options, please contact us directly at 1-866-942-6663 or visit us via live chat and speak with a knowledgeable representative. This is a special order item and each necklace is custom made to your specifications. Special order items are a final sale. Please enter your desired Monogram letters from left to right. For example, the item shown here on this page features the letters FMJ.